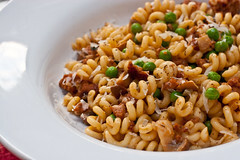 Upon special request from Jane, here’s my spicy sausage pasta recipe. Heat the olive oil in a frying pan and with the pan on a high heat throw in the sausages. Use the back of a wooden spoon to break them up so that they become like coarse minced meat. Once they’re broken up leave them for a good few minutes so that they become brown and crispy. Resist the urge to stir! Boil some water in a large pan and get the pasta cooking. Cook for the time stated on the packet. Add the fennel and oregano to the sausage then stir and leave again to get brown. Stir in the mushrooms and leave to soften. Turn down the heat and add the onion. Let it cook gently for a few minutes before adding the garlic. Cook for a couple of minutes before adding the lemon zest and some salt and pepper. Go easy and taste as you the salt because the sausages can be salty, as can the cheese you will add at the end. Check your pasta, it might be done. Pour in the lemon juice and white wine, bring to the boil then turn down the heat and let the sauce reduce. Your pasta is probably cooked by now. Drain it but save some of the pasta water. If the pasta isn’t cooked, the sausage mixture can sit cooking gently away for as long as it takes your pasta to cook. If it is starting to dry out but the pasta isn’t cooked, add a tablespoon or 2 of the pasta cooking water to the pan. Add the peas to the sausage mixture and stir through the sauce before tipping in the pasta and a few tablespoons of the pasta water. It sounds odd but it just brings the sauce together really well and gives it a shine. Stir through half of the cheese and dish up. Sprinkle the rest of the cheese on top of the pasta and tuck in!